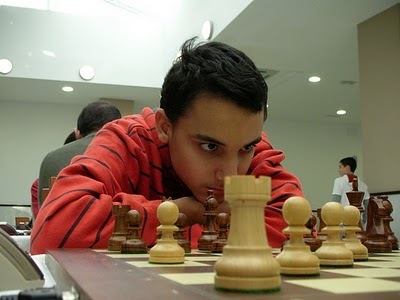 The young 14 years old talented international master Kiprian Berbatov won the 2010 edition of Ajedrez Roquetas del Mar. Berbatov collected 7,5/9 points and won the gold medal ahead of 126 players, 6 GMs, 14 IM, and 10 FMs. Second position was for the Argentinian star GM Fernando Peralta with 7,0/9, who came ahead of IM Jordan Ivanov and IM Panelo Marcelo on tiebreak. The top seeded GM Oleg Korneev finished 12th. Kiprian Berbatov is born August 6th, 1996 in Blagoevgrad. He is national champion in multiple editions of youth championships, but first gets noticed after his sensational ictory at Memorial Baharov with 6,0/6 in the presence of over 10 grandmasters. In July and August 2008 Berbatov covers three norms for international master, and in September the same year he becomes European junior chess championship which took place in the German city Herz. In the spring of 2009 Berbatov wins Mtel Mastes junior. Currently Berbatov is the second highest rated player U14 in the world. Kiprian Berbatov is cousin of Manchester United’s striker Dimitar Berbatov, and showed last spring that he plays good soccer as well during Chess Utd’s victory over Levski. With the victory at Roquetas del Mar, Berbato will be only a few points from the 2500 barrier. The fact that he played only against two grandmasters will deprive him of the right to walk away with a norm.